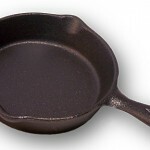 My husband remembers his Mom’s cast iron pan, how it looked like glass and never stuck. Needless to say, we had to get one a few years back. He has seasoned it properly…many times. He has coached me on how to use it properly…oil or grease is usually not necessary. He has told me how I should never, never use soap and water to clean it…just wiping it out with a paper towel is sufficient. It’s main storage place is in our oven, as we simply don’t have the storage space elsewhere for it. We’ve had it for years…it always lives in our oven. So how come I forgot it lives there today, tried to remove it once the oven was head to 450 degrees so I could put the garlic chicken there, and received a three-inch burn down the side of my hand as a result?